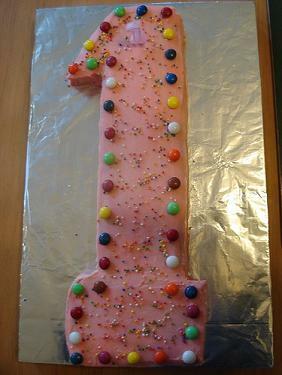 Ah, the first birthday cake!! 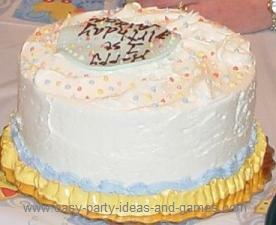 You can plan a theme, or let the first birthday be the theme itself! A great example of using colors to match your partyware! 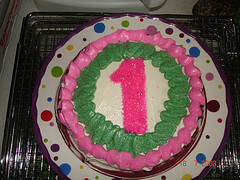 A shaped cake pan was used to make this #1 cake. Isn't this cute? 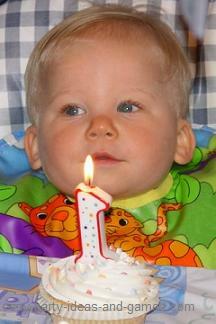 Lots of families have a cupcake or small cake just for the child who is turning one. They can feed themselves these little cakes and make a fun mess doing it! Sometimes making the mess is more fun than eating the cake! Have some toddlers that will be attending the party? The birthday child won't be ready to participate, but the older kids will welcome something to do. Find some Games for Young Children to go with your first birthday cake!